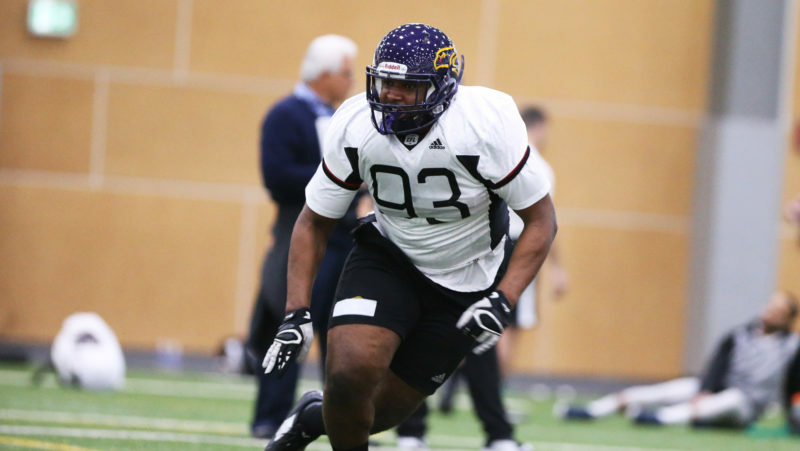 Rashari Henry is a defensive end for the Wilfrid Laurier Golden Hawks. 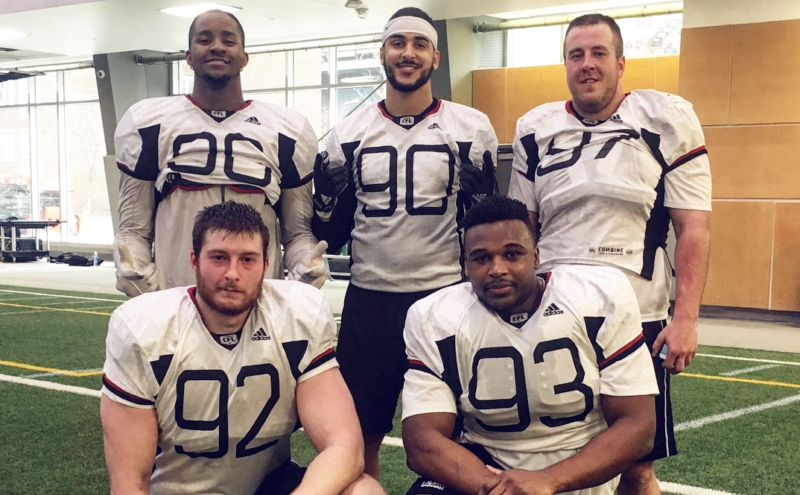 Henry writes about his experience at the CFL’s National Scouting Combine in Winnipeg. 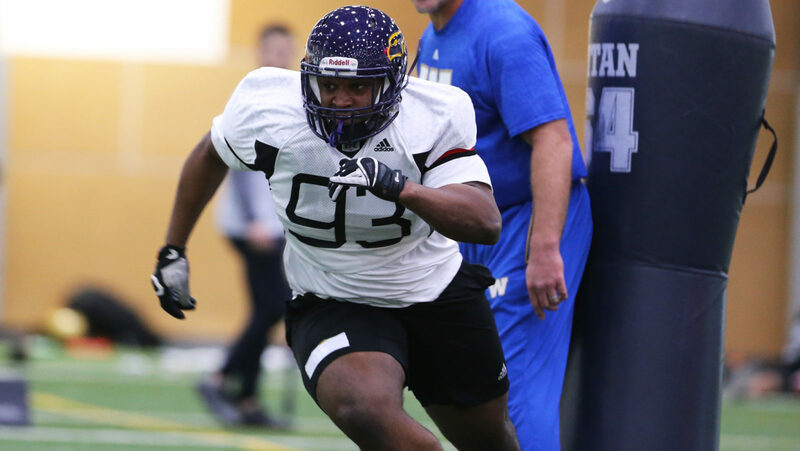 The date was January 3, the first day of school, when I found out that I had been invited to the CFL National Scouting Combine presented by adidas. My teammate, Godfrey Onyeka had messaged myself and my other teammate, Isaiah Guzylak-Messam, in a group chat at 7 a.m. Safe to say, it was definitely better than any good morning text I’d ever received. At the moment, I was filled with excitement and validation that I was considered one of the top players from across the country. Now, I’d like to take it back to February 2017, when I received an email saying that I was headed to the U SPORTS East-West Bowl. But that time my reaction was a little different. I expected to be chosen but I wasn’t as excited. I was more worried and questioned whether or not I was truly good enough to compete with some of the best in the country. Looking back at it now, I think that’s the whole point of the game. To test how good you really are and to see whether you rise or fall under the pressure as CFL coaches track and film your every move. That week of practices at Laval were definitely some of the most gruelling I’ve been put through but they were also the best I ever had. That week, I realized something extremely important about myself, which was that I thrive in situations that are highly competitive. Being around some of the best players for a week forces you to elevate your game to exceed the others to stand out in a sea of talent. I knew that this week was where I’d get the chance to make a name for myself and prove that I could compete against the best and that’s exactly what I did. From that week on, I tried to bring that same mindset and intensity with me back to Laurier because I knew how much better of a player and teammate it made me and those around me. For the first week of training camp at Laurier in August, I wore my East-West sweater every day to remind myself of my performance that week and to set the standard for how the season would play out. Now back to getting ready for the combine. I had already messaged my trainer, Jesse Collins, in December and started on a training plan that month. I knew that I had a lot to prepare for and wanted to get started as soon as possible. Training involved being at the gym five to six days a week and doing speed training on Wednesday’s. If this sounds like a lot to you, that’s because it was. But wait, there’s more! There’s that thing called school that you still have to do and your trainer still has to be paid, so you have to find a couple hundred dollars a month to pay them. Oh yeah, you also have to live somewhere so add in rent and you’ll probably need to eat something…so yeah, I think you get my point. The months leading up to the combine are exciting but they’re also extremely stressful and require a ton of preparation and planning. I was fortunate enough to work for one of my previous professors, Robert McLeman, during the semester in a research assistant position that I could do from home and that paid me extremely generously. This coupled with student loans, an athletic scholarship and my parents made my money stresses almost non-existent but a lot are not as fortunate to afford such luxuries. Your overall success at the combine is also linked to the training and resources that you can afford to prepare you for one of the biggest job interviews of your life. A couple weeks before the combine, I was extremely stressed and anxious. More so than I was at any point during the actual combine. I had to keep telling myself that it served no purpose to worry twice about something so I might as well save it for the actual moment I was there. Funny enough, once I got there, I felt more relaxed and comfortable than I had in any of the months leading up to the combine. The fact that I got to see a lot of the same faces from the East-West Bowl and knew that I had spent months preparing for this moment made me feel at ease and brought me back to the feeling of validation that I had felt during the East-West Bowl. The only nerve-racking thing for me were the interviews. Most of the interviews on the first day were for all the lineman so we were going in there blind. Trying to remember the names of all the coaches was the hardest part and once I got there, everyone either didn’t look like their photos or I just couldn’t remember their names at all. The worst part was that they were staying at the same hotel and were often in the halls or roaming around, which made it a game of “guess the coach” or duck and avoid leaving your hotel room at all costs. I tried the latter but was only semi-successful. From talking to players from the past, they had multiple “horror” stories about getting flamed in interviews. Each team had their own tactic and it was your job to figure it out. Some teams would fill a small room with a dozen coaches and some would only have two. Some would be more of a conversation and others felt like an interrogation. One interview I’ll remember is Saskatchewan’s. I heard that they were sometimes tough on players and with just my luck, they had added me to their interview list just a couple hours before so I was going in there with little to no preparation. However, to my surprise, it was an extremely laid back interview and I must say Coach Chris Jones knows how to throw a party. There was food and candy everywhere and everyone seemed to be in a good mood. I remember Coach Jones holding up a Cherry Blaster and saying, “These are the best candies out there,” in a thick southern accent. He led the interview mainly and made it seem like we were just having a friendly conversation, which made it easy to answer their questions and calm my nerves. One of the odd parts of the combine was the weight and height measurements. All the prospects and coaches were brought to a large auditorium where we all had to go up on stage in just our spandex and get measured, weighed and turn around with our arms stretched out in front of the entire room. It was like we were all cattle in a barn ready to be auctioned off to a butcher. The 40-yard dash was up first and would either boost or dwindle your mood for the day. For most prospects, it was the latter but we had to make the proper adjustments (ie. change into runners) and adapt to the situation. After all, not every stadium’s turf is the same and I’m sure coaches were taking note of who was letting the conditions affect them the most. The following day were the one-on-ones and you could tell everyone was getting excited. After all, that’s what we all came to do, show what we can do as football players and either make up for some poor testing numbers or prove that you’re more than just a good tester. 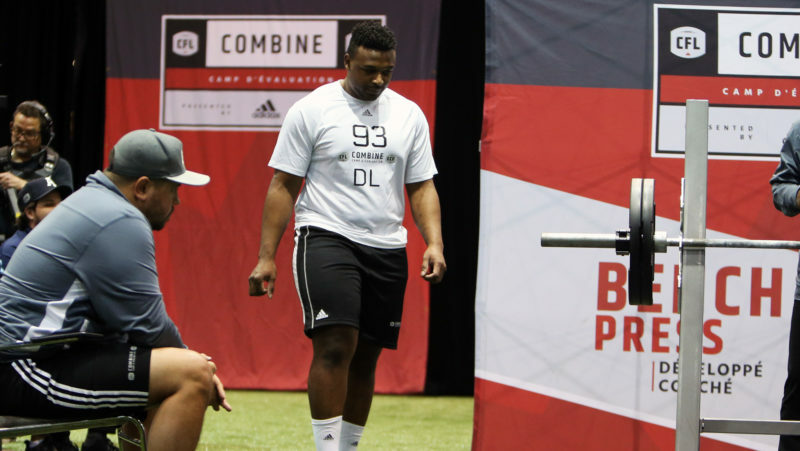 I think I speak for all the defensive lineman that we were a bit concerned with how many there was of us and how tiring this portion of the combine would be. Thankfully, the coaches took note and gave us adequate break times to catch our breath and drink some water. However, for myself, somewhere in the middle of one-on-ones I swear I was going to throw up at any moment. I think it was nerves because it came out of nowhere and my stomach just didn’t feel right. All I could think to myself is one, “Where the hell is the water guy?! ; 2, “You CANNOT throw up! If you do, it will not look good at all on your part.” Thankfully I held it down but looking back at it, I can only imagine some of the headlines that would come after I projectile vomited during one of my reps. “CFL prospect ‘projects’ well during one-on-ones” is just one of the many I can think of. Once the whistle blew, I knew that I was in the clear and a huge weight had been lifted off my shoulders. The combine was finally done and I could be proud of not only the performance I put on throughout the week but all the preparation and training I endured in the months leading up it. Make sure that you plan out each month leading up to the combine. That means a budget, meal plan, training, school, etc. Planning ahead will make some of the most stressful months of your career a lot more bearable. Make sure that you and your agent are on the same page and they know your goals and intentions well. You want to be able to trust that they have your back and they want to make sure that they can represent a player that has theirs as well. The interviews are nothing like any you’ve had before. Anything is on the table and you need to know and be able to present yourself extremely well in a room full of coaches identifying and asking you about your flaws. Make sure you know why you play football and what your strengths and weaknesses are prior to the coaches asking you. In a draft full of talented athletes, it is going to be hard to stand out. If you can, find a way to differentiate yourself from the rest and make it unique. You will be stressed leading up to the combine but once you’re there, just enjoy it. Recognize how fortunate you are to even be a part of something this huge and be grateful that you have been blessed with the ability to potentially become a professional athlete. And with that, I’ll end by saying thanks to all the staff, coaches, and fans that were a part of an unforgettable weekend. I want to thank Chris O’Leary for giving me the opportunity to reflect upon my experience and give an inside look at what it’s like for the prospects. I know that whatever happens in the ensuing months, this will be something that I remember for the rest of my life and feel honoured to be a part of.